Wide-angle iPhone Camera Lens: Wide angle lenses help you get more in your photo than the standard iPhone camera lens. This makes them great for landscape shots, and a good substitute for using the built-in iPhone panorama mode. Telephoto iPhone Camera Lens: This type of lens brings your subject closer to you. The larger the magnification number, the bigger the distant object will appear in your photo. Telephoto lenses also create far more flattering portrait photos, as the facial features will look more natural. Fisheye iPhone Camera Lens: Fisheye lenses create dramatic spherical images, with darkened corners and distorted lines. The distortion in these images is part of their appeal. These lenses are great for really creative shots, but you’ll need to get in close to your subject. Macro iPhone Camera Lens: These lenses help you capture subjects not normally visible to the naked eye. You’ll need to get up close to your subject and hold your iPhone very still to get detailed, in-focus images. Next, let’s look at some specific brands. Olloclip is one of the best-known iPhone camera lens brands. They offer a range of lens kits aimed at different kinds of photographer. The lens kits are available for iPhone 4 onwards, although their iPhone X camera products are still in development. The Core Lens Set comes with 180 degree fisheye, super-wide and 15x macro lenses. The Vista Lens Set has the super-wide and 2x telephoto lenses. The Active Lens Set includes the ultra-wide and 2x telephoto lenses. The Macro Lens Set has 7x, 14x and 21x macro lenses. Users of iPhone 6 / 6s / 6s Plus and earlier model users should consider purchasing the 4-in-1 Lens Kit, available for $80. A new lens attachment kit has been introduced for the iPhone 7 and iPhone 8 camera. The Connect system, pictured below, allows you to easily add to your lens collection with the interchangeable setup and is also selfie-ready making use of the iPhone’s front-facing camera. There are other kits available tailored to your preferred photography style. You can choose a macro kit if you’re a fan of close-up photography. Or go for a kit including telephoto and wide-angle lenses if you enjoy landscape photography. The pendant storage system supplied lets you keep the lenses handy for use. It also serves as a steadying tripod for those macro shots. Olloclip also gets the Apple seal of approval as you can buy them directly from Apple, but you can also find them on Amazon.com. Moment lenses are renowned for their image quality, which explains why they’re considerably more expensive than the competition. Lenses are available for the iPhone X as well as for older iPhone models, right back to the iPhone 4. 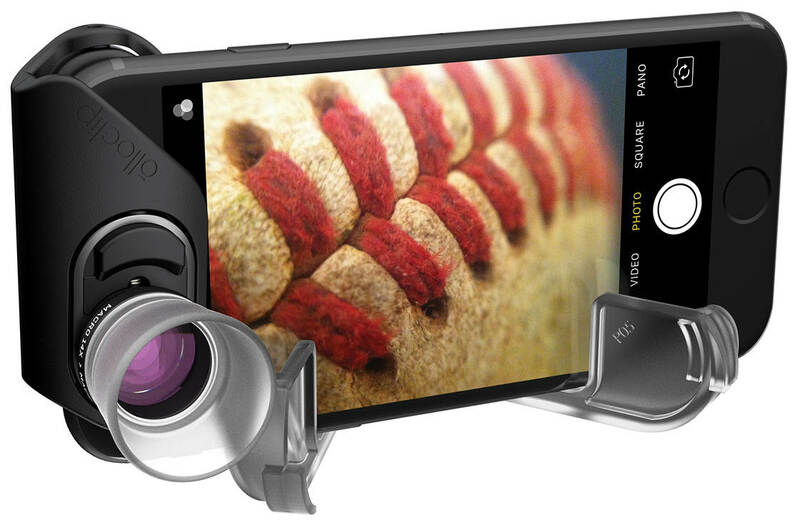 Your best option for mounting the lens to your iPhone is to purchase a custom case that the individual lenses attach to. The stylish cases will cost you between $24 and a whopping $99 for a case with a built-in battery. There is a cheaper option with a lens mounting plate. This will set you back a mere $5 though it is a permanent fixture as attached with adhesive. All lenses and accessories can be purchased directly from Moment, who also offer a trade-in service. Send in your old Moment lens and get a $25 voucher towards a new one. Oowa take a unique approach to the design of their mobile lenses.  Their oval asymmetrical design results in a clearer image with less distortion than seen from some other competitors.  The lenses are claimed to be the highest quality mobile lenses on the market and comparison tests support this claim. If you’re an avid user of Instagram you’ll get to see what regular people produce using these lenses. The company has an active team of users showing off the lenses at their best. Check out the #MadeWithOOWA hashtag to see for yourself. The iPhone camera lens range on offer is limited to a 2.5x telephoto lens and a wide-angle lens. Unfortuantely, Oowa don’t supply a macro lens. So, if you’re interested in taking close up shots, then consider a different lens system. 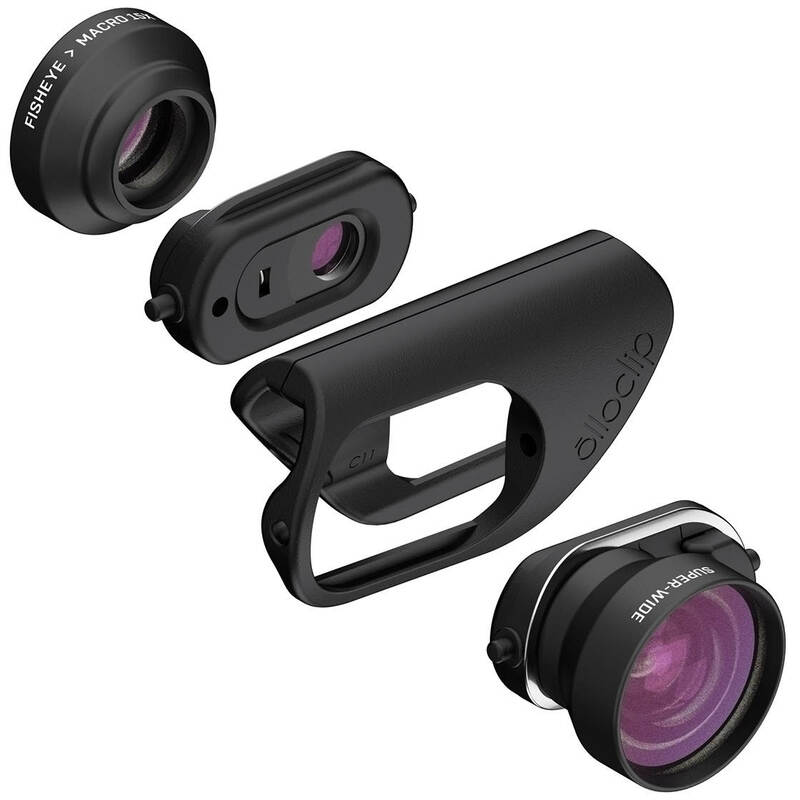 You’ll also need the Oowa phone case to connect the lens to your phone. Get the whole set by choosing the Pro Kit which is currently available for $109. You can also purchase the individual lenses for $69 each. You’ll get two phone cases, lens caps and a carrying case included with your individual lens purchase. The lenses are available for iPhone 6 and above but not yet available for the iPhone X. Also note that if you have an iPhone 7, the telephoto lens is only compatible with the 1x phone camera. 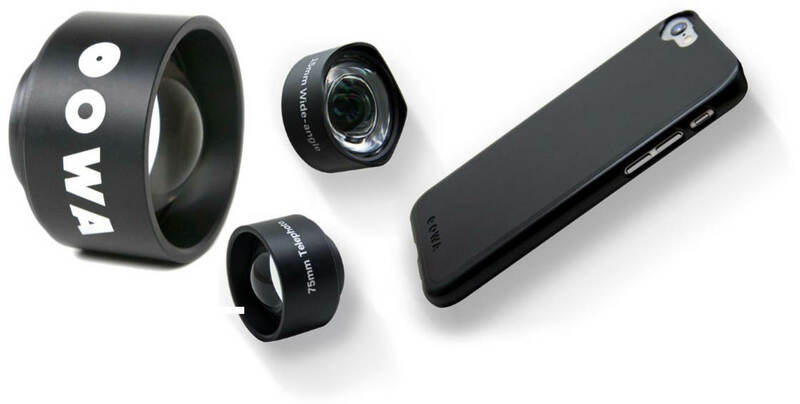 The lenses attach via model-specific iPhone case costing just $15. Next time you upgrade your iPhone, you just need to purchase the corresponding case. SANDMARC are best known for their GoPro and DJI camera accessories. But they’ve been creating lenses for iPhones for several years and are fast becoming a household name. Based in California, their focus is on action photography, but they offer a range of iPhone lenses for landscape and macro photography too. With its 16mm focal length, the wide-angle lens lets you capture much more of the scene than the native 28mm iPhone lens. It’s a large lens and weighs in at 71 grams (2.5 ounces), and its weight does make the iPhone feel a little unbalanced in the hand. It’s not a big problem, but it can make holding the iPhone in one hand a little challenging. In terms of image quality, it’s very impressive.  There’s very little image distortion and minimal softness in the corners or along the edges. It’s the perfect lens for landscape photography, or social events where you want to capture more of the available scene. This 10mm fisheye lens lets you capture even more of the scene than either the SANDMARC Wide Edition Lens above, or the native 28mm iPhone lens. The lens is fairly bulky and weighs 55 grams (just under 2 ounces). However, it’s a little smaller than the SANDMARC Wide Edition Lens, so not too large or obtrusive. As with all fisheye lenses, there’s a significant amount of lens distortion, but this is part of the appeal of a fisheye lens, so don’t let this put you off. The image quality is very good, but in the corners and, to a lesser extent, the edges of the frame, you’ll get some softening of the image. Therefore, it’s important to keep your primary subject near to the center of the frame. The macro lens is very bulky, but this is mainly due to the removable plastic hood supplied with the lens. The actual macro lens itself is relatively small, and can be used without the plastic hood or the heavy threaded ring which connects the macro lens to the hood, making it much more compact the shown above. The plastic hood is incredibly useful, as you can press it against your intended subject to ensure the iPhone’s camera and the subject are the optimal distance apart. This helps you to have at least part of your subject in focus. The image quality is really good, but there’s a little softening in the corners and along the edges of the frame. It’s not too distracting, especially if you keep your macro subject centrally positioned. This telephoto lens is another solid, well-built, lens which provides 3x optical zoom when positioned over the iPhone X’s standard lens, either using the case or the clip provided. The 3x optical zoom is an increase over the iPhone X’s 2x telephoto lens, but even better than that, if you position the lens over the iPhone X’s telephoto lens using the Clip-On attachment, you get a huge 6x optical zoom! At the budget end of the scale, Amir offers a choice of various different lenses and kits. 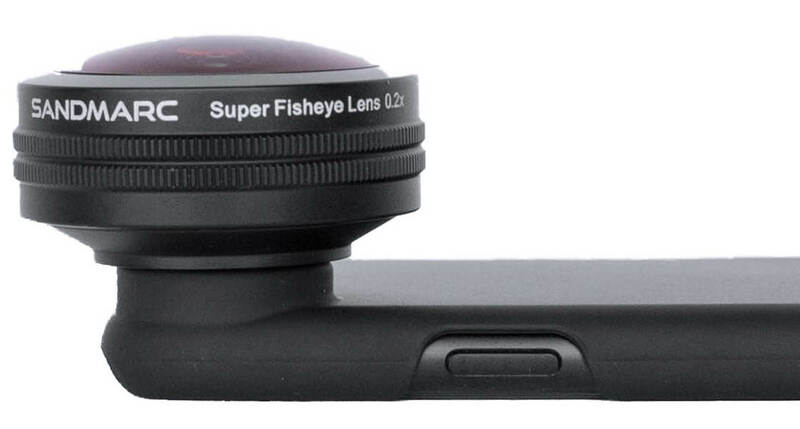 The 3 in 1 lens kit consists of a 0.4x super wide-angle lens, a 180 degree fisheye lens and a 10x macro lens. To use the fisheye lens make sure you keep it screwed to the macro lens. And then unscrew the pair to make use of the macro lens. At 10x magnification, the macro lens gets you enough close-up detail to be impressive but is also relatively easy to use. You get a handy cleaning cloth bag and lens covers as part of the kit – perfect for keeping your lenses in pristine dust-free condition. Choose from black or silver for the lenses themselves. 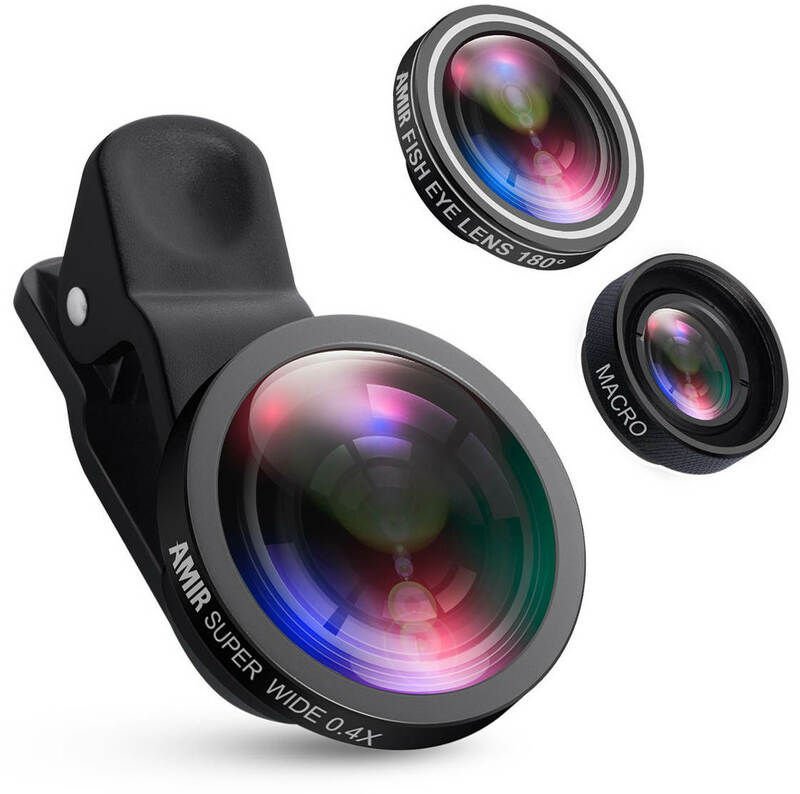 The Amir lenses attach to your phone using a clip. This is a versatile fitting that is compatible with many models of iPhone, from 5 through to 8. The interchangeability is great for when you upgrade your iPhone as the lenses aren’t model specific. The design also lets you connect any 37mm threaded lens to the clip. It’s fair to say that such a cheap lens won’t give you professional results, but they’re a lot of fun and can be used to expand your iPhone photography beyond what the iPhone’s native lenses allow. The Amir 3-in-1 Lens Kit costs under $20. There are clearly plenty of options available to you to further utilize your iPhone for photography. Weigh up what’s most important to you to help you choose a system that’s right for you. A lens kit gives you the most flexibility, but a single, more expensive, dedicated lens will give you a better quality iPhone camera lens to do a specific job. Remember to also think about what suits you in terms of how the lenses attach to your iPhone. Each lens system offers their own approach. Price is also likely to be a consideration and consequently interchangeability between different iPhone models when you upgrade.